The Aztecs made countless types of noisemakers and musical instruments. Using clay, sugar cane, turkey feathers, ores, frog skins, and much more, they were able to create sounds to be associated with many life events. They had conch shells for ceremonies, ocarinas for making animal grunts to attract deer, flutes for traditional music entertainment. Some researchers even believe sounds were used to treat physical and mental illnesses. But the most interesting device they created was the Aztec Death Whistle. All your mind can conjure up is an army of the undead screeching at the top of their decrepit lungs. Skeletons, zombies, and all manner of nether-worldly beasts unleashing their most terrifying war cries, ready to erase your calvary within the next 30 seconds. 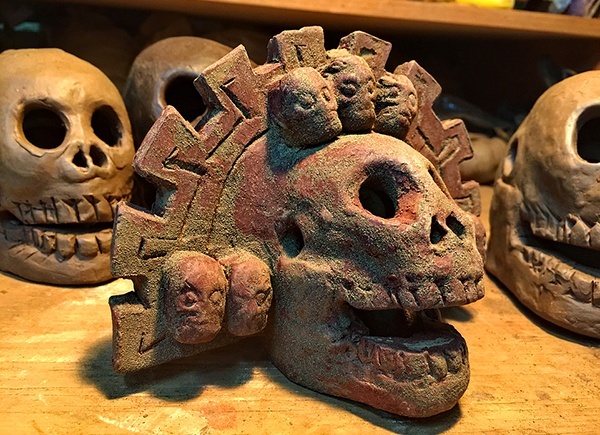 All you can find these days are replicas, but thanks to Xavier Quijas Yxayotl we're able to hear the macabre sounds of a genuine Death Whistle. He explains in the video that these were used for Day of the Dead celebrations and other ceremonies, but their true purpose was for psychological warfare to shake up the opposing military force before combat began. Hundreds of warriors would play these instruments all at once, sending shivers down the spines of their unsuspecting enemies. Nobody seemed to bother to consult people with actual Aztec ancestry, so when, almost 20 years ago in 1999 when these skull-shaped whistles were first found by archaeologists, they didn't think much of them. They assumed they were toys or ornaments and dismissed them as unimportant or common place. Studies were quickly written and filed away on their shape, size, resemblance to skulls, and the hole placed on top of them. Finally someone thought to blow through the hole, and now these "mere toys" are attracting the attention of historians and musicians alike. They were discovered at an Aztec temple dedicated to the wind god Ehecatl, held in the hands of the skeleton of a male sacrifice victim. That would explain why these weird musical instruments are shaped as they are and sound like ghosts screaming through the winds. Now that they know what to look for, they've found more, but not enough that they're readily available for any of us to purchase or play with. Most are stored away in museums, as you would expect. Roberto Velázquez Cabrera believes he knows more to the story than is generally accepted. We're inclined to agree since this mechanical engineer has spent many years recreating these death whistles in order to understand and better examine their sounds. He is the founder of the Mexico-based Instituto Virtual de Investigación Tlapitzcalzin, using his well-rounded knowledge of the Aztecs to inform his conclusions. In his article for MexicoLore, Roberto states that the death whistle is likely an uncommon instrument, explaining why we found so few so late. He says not only were they used for battle and Day of the Dead celebrations, but they were likely used during human sacrifice to help guide the souls of the victim towards the afterlife. Sacrificed people and deceased enemies alike are to be respected and their journey to the underworld should be aided. There are many mysteries locked away from us from pre-Columbian music and sound engineering, and the Aztec Death Whistle convinces us that maybe we're better off that way.